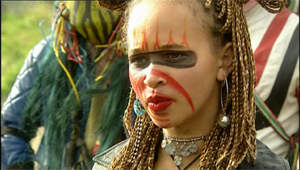 First seen in Series one, Episode one of The Tribe riding, around with the Locos at Zoot's side, Ebony made herself a clear presence in the city. She is a sardonic, manipulative character who knows how to fight (physically and mentally) and is innately driven by power. It's that strong personality in addition to her feminine charms that helps her often gain what she desires. From faking Amber's death and trying to poison Tai-San, to shoving Ruby in front of a truck, she will stop at nothing to insure a future with her getting what she wants or feels entitled to. After her pre-virus partner, Bray, unveils to her his brother Zoot was dead, Ebony takes that as an opportunity to capitalize on her fallen leader's death. Spinning a tall-tale to the Locos about a vision where Zoot spoke to her and gave her the rights to leadership in his absence--with his talisman, given to her by Bray as dubious proof--she easily assumes control as their new, callous leader and queen. Ebony is never one to do anything out of the kindness of her heart, there is always an agenda behind her 'good deeds'. At the end of Series One, after failing to seduce Bray, she and her Locos rescue the Mall Rats from a fire set by Tribe Circus in the mall, then she accompanies them to Eagle Mountain in hopes of getting her hands-on the antidote. Though sometimes her actions are tyrannical, Ebony is a naturally strong leader. The City is often swept up in her invigorating speeches that can either calm--bailing the Mall Rats out of trouble--or incite a crowd to her control. This is mostly why, though she is not fully deserving, the Mall Rat's allow for her to remain a part of them, no matter how many times she leaves or betrays them. In addition to using her feminine wiles to cut corners and get what she wants, Ebony is a good actress. She appears confident, keeping a wall up, disallowing anyone to get close to her and see that she is like everyone else, plagued by fears and insecurities. Sometimes a softer, mellow side of her peeks through her cold-hearted facade as represented highly in Series Two after being rescued from Spike by Tai-San and Alice, in Series Four when she fell in love with the Technos General, Jay, and again at the start of Series Five when she was emotionally vulnerable and being subjected to psychological abuse by doses of reality space in her sleep. Oftentimes however, these subtle changes in Ebony's character are sabotaged not only by herself and her inability to set aside her jealousy, but also by the betrayal and abandonment she feels from people she's befriended, or in the romantic sense: loved. Ebony's attitude and manipulative actions, while not justifiable, are better explained when it's revealed in Series Four that she has two older sisters: Java and Siva. The relationship dynamic of the trio-- which inspires, rather than dissuades Ram, to marry her--gives light to some of Ebony's background beyond attending school with Bray, Martin, Jaffa, and Trudy. It makes it evidently clear some of her distrust in others stems from dysfunction and rivalry born within her family. Java hates her ultimately for being born, but also because in her drive for power, Ebony left her sisters to die. Siva, caught in the middle, mostly sees things Java's way, but is able to make peace with the past and move forward, forgiving her baby sister. When in Liberty during the fifth series, Java challenges Ebony to a showdown and Siva races between them as Java issues a kill-shot, falling to her death. Ebony, outraged at Siva's dying, fires back at Java, killing her. It's from that point on in the series Ebony, once again, turns back to her cold self, focusing her efforts on exacting revenge on Mega and his Technos. With the remainder of the shows surviving, central characters, Ebony is last seen on the boat that jets away from the docks as their city falls victim to the newly unleashed virus. Ebony's style was designed to emphasize her strength and let others know to beware of her. Though once or twice shed, she can always be seen in leather pants, which early on were brown or a deep purple, but later black and red with wide legs and paneled designs often cut off in places to show off her thighs and legs. These pants were paired with revealing, leather tops that are cut out to accentuate her midriff, pierced belly button, and cleavage. Her signature blond and brown braids, which in later seasons were plated with other colors like silver/gray and red, were pulled back in a single pony-tail or a triad of ponytails. Her hairstyles always somehow worked in two or more feathers. She chose to wear either chunky, thick necklaces, sometimes multiple at a time, or choker-style necklaces. These were paired with earrings either matching pairs or not and bracelets or wrist-cuffs and arm bands to her liking. She liked to wear lipsticks that were dark plum or brown early on, and later a vibrant red. This lipstick is accompanied by a signature bandit mask across her eyes that evolved throughout the series in both thickness and colors as well as the way it shaped/emphasized her eyes. At one point her eyes and eyebrows were accompanied by small, yellow/gold make-up jewels. Also, when she was a Loco she bore their distinct, red marking on her face and early on that was replaced with a signature flame on her forehead which changes from more freehand to a more precise design by the show's end. During her first wedding to Ram in Series four, Ebony wears a sleeveless, white, sheath dress with a tight bodice that connects with a halter strap around her neck. The sheath is cut in the front to show off her strapped, white shoes. She wore a beaded accent piece off one of her shoulders and drop earrings. Her make up was very light, her bandit was replaced with a bindi in between her eyes, and her signature blond and red braids were done up in a bun held in place by some kind of hair piece and a white feather and lily. In her second wedding (to Zoot) in Series five, Ebony wore an ensemble, which is only presumed to match her state of mind at the time. Her dress was of a shiny, silver nylon fabric that appeared black. The front of the dress had a form fitting bodice with thin straps on the shoulder. The bust down to the waist is in a design reminiscent of a cage that shows off her midriff with a thick piece down the middle covering from her sternum down to her belly button. At the waist she wears a large, black belt with netting sewn over it. The lower half of the dress is a simple a-line and drags to the floor with a split part-way up the thigh. The tiara is accented with reds and blues and has a long, black veil which attaches to it. The look is not complete without her necklace that is of a twisted, beaded design with rows of white and blue/black.